At last Eddie Jordan Racing won the title. After five years of losing out to West Surrey Racing, Dave Price Racing and Madgwick Motorsport, Jordan secured continued sponsorship from Stelrad, and added the driving services of highly regarded Johnny Herbert. For many years, F3 had seen little technical variation, with Ralt RT3s and John Judd Volkswagen engines being the standard choice, but the emergence of Reynard and the arrival of new engines from Toyota and Alfa Romeo meant that the key in 1987 was getting the right package. The EJR package of Reynard 873 and Spiess-tuned VW gave Herbert a narrow edge which he exploited by winning five races. Ralt and Reynard shared the 18 race wins evenly between them. Ralt's leading runner was Bertrand Gachot, but Gary Brabham, Martin Donnelly and future World Champion Damon Hill all won races in the new Ralt RT31. Field sizes were down slightly from 34 to 32, and concerns were expressed about the level of promotion from the BARC and BRDC. A threat was expected from the new Vauxhall/Opel/Lotus series which, with the benefit of hindsight, need not have given anyone sleepless nights. Points table from Autosport 10 Dec 1987 p42 (and checked against Autocourse 1987/88 p265). The points system was 9-6-4-3-2-1 with an extra point for fastest race lap. Although Johnny Herbert used Siegfried Spiess's VW engine to win the title, VW's hold on F3 was being loosened. 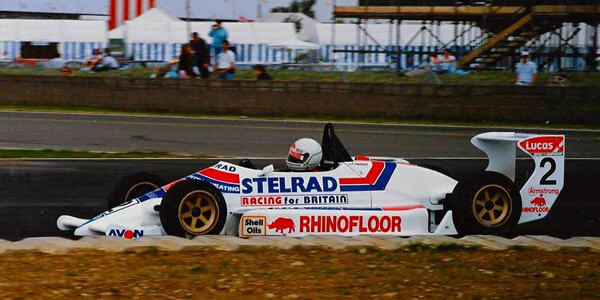 As well as the Toyota 3S-G powerplant being used by Martin Donnelly and Damon Hill at Swallow Racing, West Surrey Racing had Novamotor's new Alfa Romeo twin spark unit in Bertrand Gachot's Ralt RT31, as did the Reynard R&D team. Madgwick Motorsport converted their Reynard 873s to this powerplant during the season. VW engines were used in a total of seven race victories, Alfa Romeo in seven, and Toyota in four. There was a Class B championship run "for cars pre-March '87 without electronic management systems or six-speed gearboxes" which was won easily by Gary Dunn in a Reynard 863-VW. The results here have been compiled by Chris Townsend using the main British magazines Autosport and Motoring News but also the US magazine On Track which carried good coverage of the British series. Race and qualifying results are largely complete but entry numbers are not always known. Please get in touch if you have any F3 entry lists, programs or official results hand-outs. Ralt chassis records allow a lot of the RT3s to be identified and it was common for Autosport and Motoring News race reports to mention former owners of second-hand cars. Autosport adverts as well as its 'Pit & Paddock' and 'Sports Extra' sections add further information on car movements. We are also grateful to Tim Murray, Jeremy Jackson, Adam Ferrington and Kevan McLurg for their help o the 1987 season.